Hoe Avenue in the Bronx has nothing to do with farming, although it once indeed ran through a grand 19th century farm estate. The avenue’s namesake, Richard March Hoe, born 200 years ago today, brought about a revolution in the world of printing. Without his innovations, the phrase ‘hot off the press’ might never have come about. His father Robert Hoe, born in England in 1784, the year after America won its independence, moved to the new country and began a printing press business in lower Manhattan (10 Cedar Street) with his two brothers-in-law. Hoe tinkered with improving the hand-operated press machine for the ever-demanding industry of New York publishing. 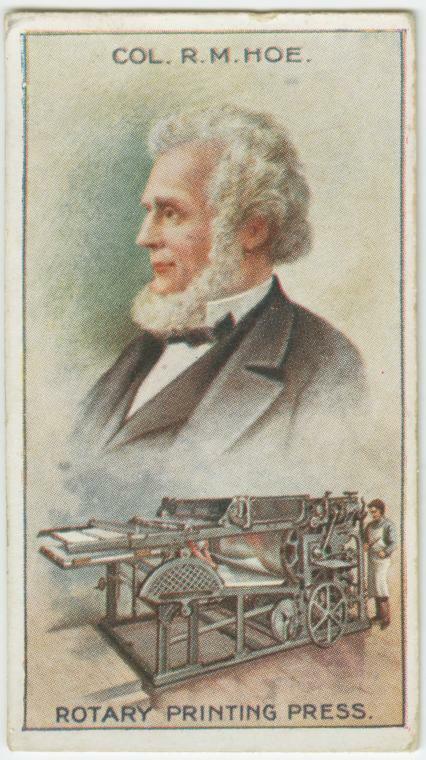 But it would be his young son Richard (born Sept. 12, 1812), taking over the reigns of the company in the 1830s, who would change the world of printing forever. The answer, of course, was steam power. It had forever changed the worlds of industry and transportation during this period. In 1843, R. Hoe & Company introduced a rotary printing press (nicknamed the ‘lightning press’), using a revolving cylinder drum that rapidly turned out thousands of printed pages using steam power. His influence on the publishing world by the 1840s cannot be overstated. New York’s penny press, led by newspapers like the Sun, the Tribune and the Herald, utilized the technology to expand their circulation. Soon newspapers across the country were being made using the Hoe printing press, inspiring the growth of daily publications, turning the newspaper into an everyday item and creating a greater demand for the quick delivery of information. Above: R. Hoe & Company at 504-520 Grand Street. If that wasn’t enough, a decade later, Hoe acquired the technology to fold the newspapers as they came off the press. Interestingly, the company also distinguished themselves in the manufacture of saw blades, a side business not completely unrelated, as they were used to cut metal type. 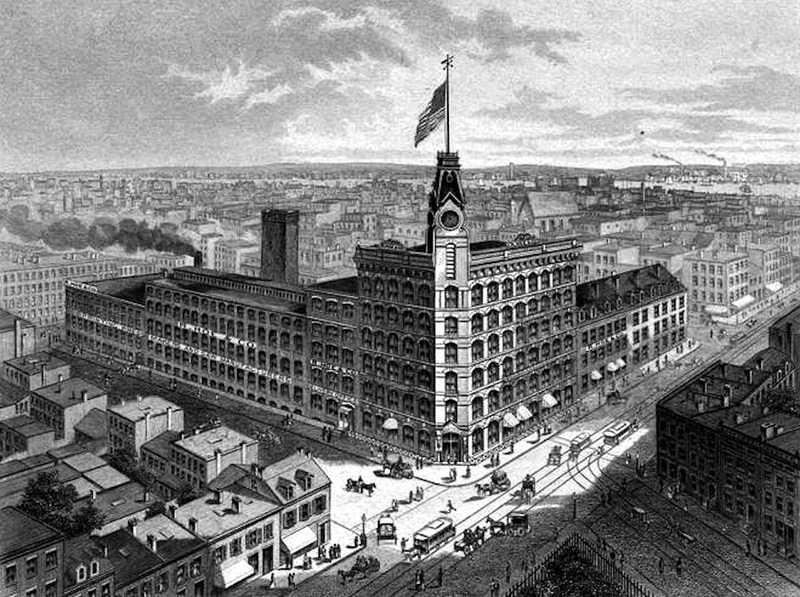 While Hoe conducted business from the Lower East Side and from offices in London, the printing-press mogul resided in a lavish 53-acre estate named Brightside near the Bronx River, on land once owned by the family of Gouverneur Morris, with plenty of room for an orchard and land for his prize-winning Jersey cattle. His brother Robert bought the neighboring land and opened his own estate called Sunnyslope. Most signs of these estates is long gone, of course, with the exception of Hoe Avenue. For modern pop culture junkies, the street is perhaps best known for the Hoe Avenue peace meeting, an assemblage of New York street gangs calling for a truce that inspired the plot of the 1981 film ‘The Warriors‘ (in particular, the ‘Can you dig it?’ scene). Nearby you’ll find another street named for printers: Aldus Street, a modification of the name Aldo Manuzio, a 15th century Italian printer At the corner of Aldus and Hoe is a small playground called Printer’s Park, with playground equipment made to look like a rotary printing press. And nearby is a small garden called — no beer jokes please — the Hoe Garden. Richard Hoe died in Florence, Italy, on June 7, 1886. Pictures courtesy New York Public Library.